This is a beautiful vintage musical jewellery box, dating to the 1950s. It has a stylish angular form but with lovely rounded edges and corners that give it a soft appearance. 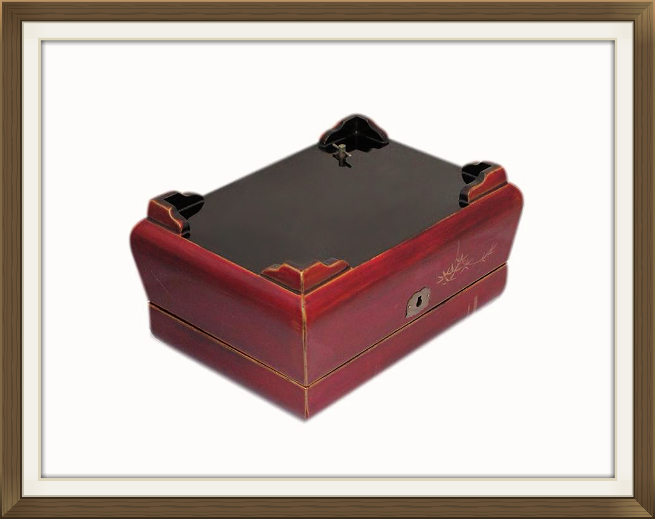 The box was made in Japan and has its original Sankyo 18 note musical movement. We have not been able to decipher the title of the tune but it is very pretty! This box was made by the Japanese firm 'Daysun'. The company's name is on the bottom of the box, in lovely hand painted script. 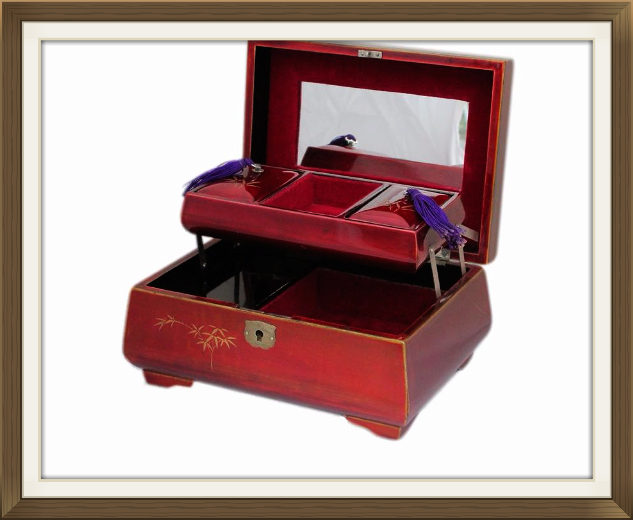 The box has a glossy and shimmery lacquered finish, in a deep maroon red shade. 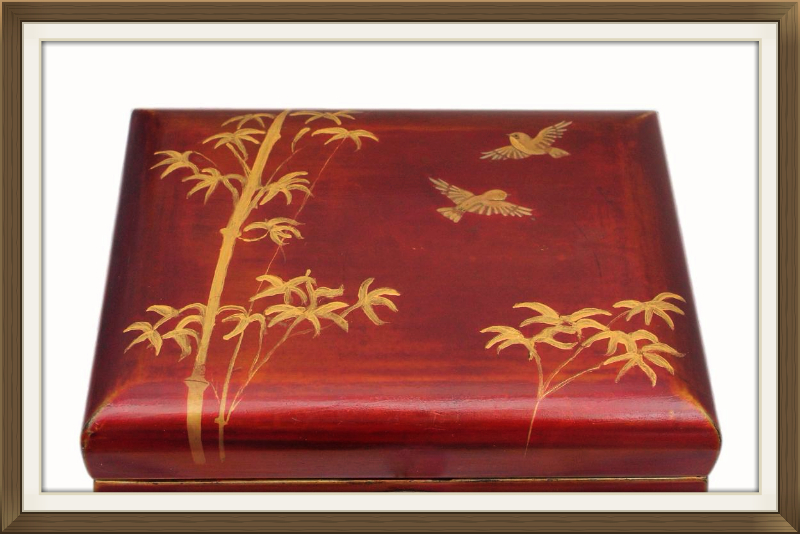 The lid has a pair of beautiful gold hand painted birds, and gold hand painted bamboo grasses. There is some further bamboo detail in gold to the front. There is a pretty engraved escutcheon to the keyhole, and the box is complete with its original hinges, lock and key. The lock has its Japanese makers stamp and the key still has its original pink silk ribbon attached. The lid of this box opens all the way back and was designed in this way to give better access to the interior base compartment. The lid should be opened carefully so that it doesn't fall back suddenly and damage the hinges. The interior has a lift up storage tray, which automatically rises when you open the lid. The tray has 3 separate storage compartments with decorative lids to those on the left and the right. 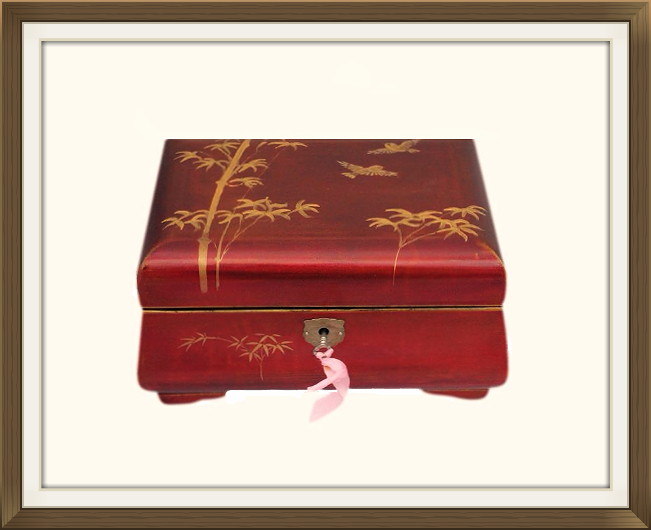 The tray and its lids have a lacquered finish which matches that to the exterior of the box. 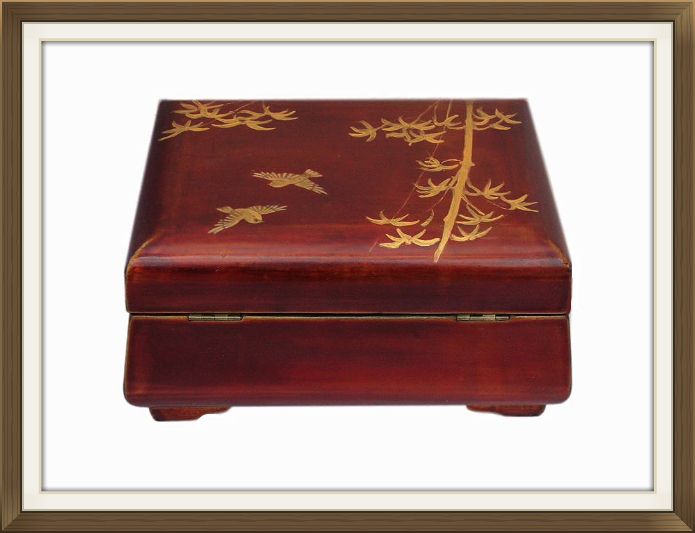 The lids have gold bamboo decoration which compliments that on the front of the box. 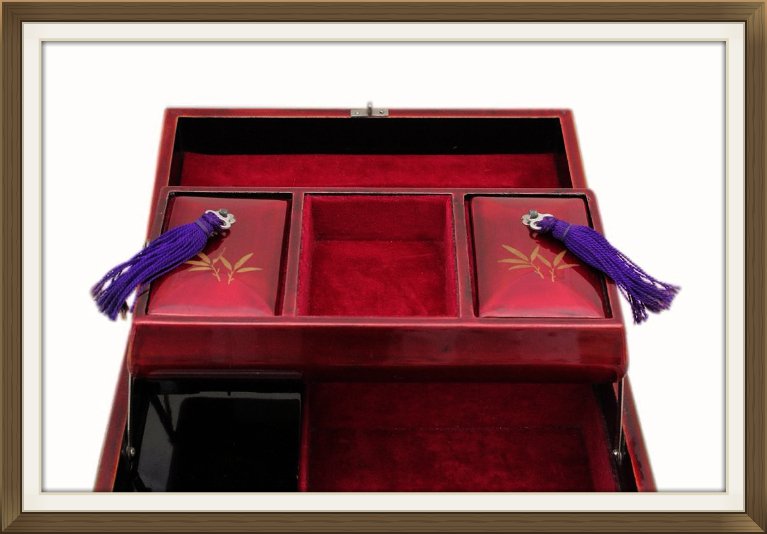 They also have their original decorative handles and beautiful vibrant purple cord tassels! The tray rises smoothly with its original white metal cantilever hinges. Beneath the tray is a further single compartment and the musical movement is cased to the left of this. This has a lovely black lacquered cover with a spring loaded catch. 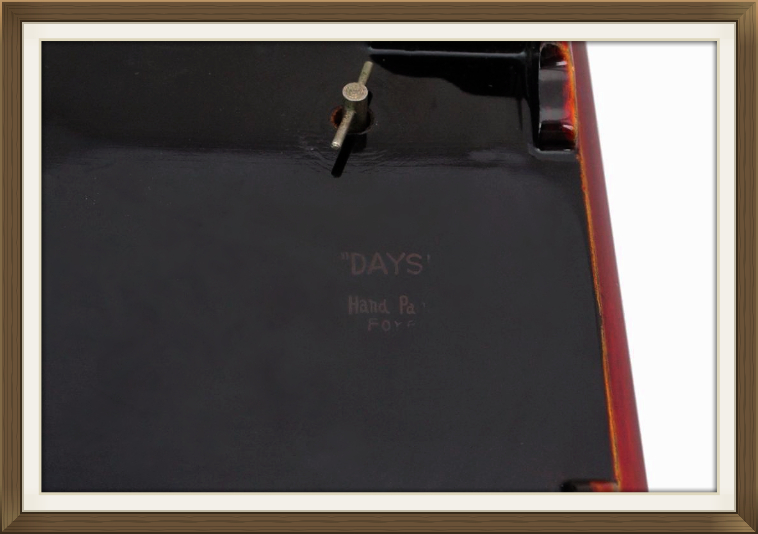 This spring loaded catch keeps the cover securely seated and is a sign of good quality. Most musical movement covers on Japanese boxes are without a catch and are often too loose. There is a beautiful clear, fitted mirror, to the inside of the lid. This is neatly framed by a beautiful maroon red, brushed felt panel. 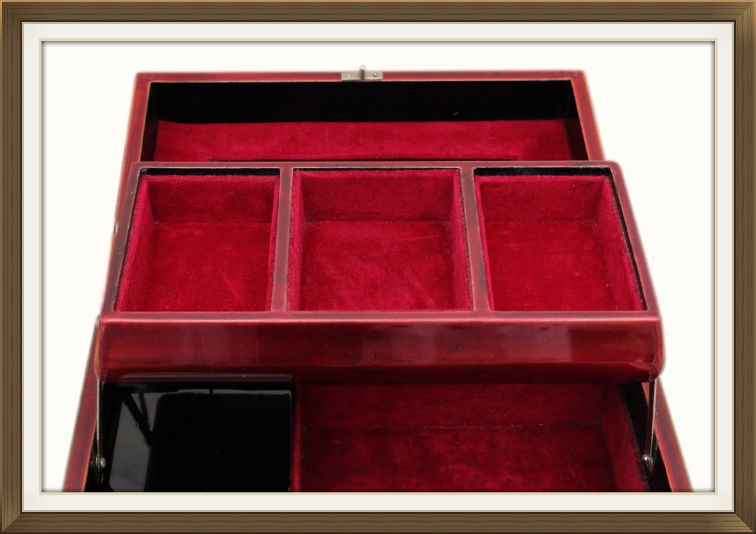 All of the compartments have matching maroon red felt linings. The felt being brushed has a lovely soft texture. The music is operated via a wind up key on the base of the box. 5 turns of the key are sufficient to play the tune in full. The music stops as it should, when the lid is closed, or when the movement is fully unwound. 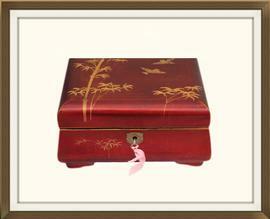 This wonderful box is in excellent condition for its 65 plus years of age. It is structurally sound and free of damage. The lacquer to the lid has faded a little, its original colour being closer to that which is on the interior tray and lids. Other than this there is some minor light age related wear, mainly on the corners of the box, as we'd expect from handling. There is some minor over spill of lacquer on each side of the lid which is not really visible unless the box is viewed under bright light. This is simply a slightly imperfect finish which occurred at manufacture. None of the above mentioned spoils the beautiful overall appearance of the box. The lacquer still has a beautiful sheen, particularly to that in the interior. All of the felt linings are in beautiful condition. They are neatly fitted and have no splits, fraying, or stains. The mirror is beautifully clear and has no chips or cracks whatsoever. The musical movement is currently in perfect working order and plays the tune at its correct speed. Its cover lifts off should it ever require attention in the future. Please note that vintage musical movements can deteriorate over time. We are not responsible for those that wear or malfunction after further age and use once purchased. 7.0 by 5.5cm with a 2.4cm depth. 7.0 by 4.5cm with a 2.4cm depth. 12.5 by 12.0cm with a 3.3cm depth.